She's no stranger to hard work: juggling working at home on the cattle ranch and horse farm with full-time study as a Junior on a scholarship in Ag business at New Mexico State University. Describing herself as a "true cowgirl to the bone," she's no stranger to horses: riding by herself since she was 4 years old, breaking horses and working them on the ranch, and, there's that side hobby of endurance riding in her spare time. At 19, Jessica DiCamillo of Las Cruces, New Mexico, has already logged over 5500 AERC miles, and racked up 17 wins, including the 2008 North American Young Riders FEI 75 miler on her horse RGS Crestwind Premiere that she broke in. At age 15 it was her first time to participate in the Young Riders. She's completed 6 100-mile rides, the first one at the age of 12. 1210 AERC miles in 2004 earned Jessica the Junior AERC National Mileage Championship, and with the combined AERC miles of her mother Karen, the duo earned the 2004 Bill Thornburgh Family Award. Despite her horse knowledge and her abundant endurance experience, it was a complete shock when Jessica got the email inviting her and the horse of her choice, on somewhat short notice, to participate in the 160-km Presidents Endurance Cup in Abu Dhabi next month as a Young Rider. "I was like, ohmigod!" Jessica recalled. "I asked, 'When's the ride?' and they said, 'February 16' and I was like, ohmigod! I can't even sleep!" Jessica will be riding her mom's horse RGS SHA Strike Two. He's a 13-year-old Arabian with 870 AERC miles in 6 seasons of endurance, 15 finishes in 19 starts, and 2 Best Condition awards. He's attempted 1 100-mile ride, where he was pulled as a rider option. All but one of his finishes were in the Top Ten, and 4 of them were wins. It's usually senior riders who are invited to compete in the grueling Presidents Cup with near-world record 100-mile finish times (under 6 minutes 30 seconds the last 3 years), and when USA Chef d'equipe Emmett Ross heard that Young Riders would be participating, his reaction was shock: "What!?" He explains, "It's a challenge, let me put it that way. But we're making a HUGE effort to push our US Young Riders, and this will be an experience, obviously. From a learning and a world exposure experience, it's fantastic. It's not the winning or the losing... it's just the experience you get. It's going to be something they remember for the rest of their lives, and that to me is the essence of riding overseas." Devan Horn of Texas is the other US Young Rider invited to compete. Emmett will talk with the girls about their goals in the Presidents Cup, and focus on what they have to do to complete the ride, which will indeed require concentration, when the winners will be riding at 25-26 km/h, while the girls will likely average 16 1/2 to 18 km/h speeds in the sand. There's the added distractions of dealing with great retinues of grooms for UAE riders in the crewing areas, riding amongst Princes of Middle Eastern countries, with dozens of cars racing madly in the sand in front of, behind, and right beside the riders, and grooms handing off water bottles to the riders as they gallop by. That shouldn't sidetrack a true cowgirl who's used to rough riding on the ranch horses, and it likely won't distract her horse. The DiCamillo horses are ranch stock horses first and they "do pretty much anything and everything we ask them to do." That includes riding up the mountains and down the hills, and roping cows. "You know the Man from Snowy River?" Jessica asks, referring to the Australian movie and the scene where Jim Craig gallops his horse down a seemingly near-vertical mountain. "Strike makes that look easy!" Jessica says with aplomb. The sand course in Abu Dhabi should be no problem to Jessica and Strike Two. "We live out here where the sand is. He moves across the sand well." Starting a race with over 100 other riders doesn't sound intimidating to Jessica either. "Strike is very powerful. He's a 16-hand horse and he's awesome to ride. But I don't worry about him in a mass start." Horses are simply a way of life for Jessica and her family, and it's likely this Young Rider will take this big new international endurance experience in stride. For Jessica, the best part of riding endurance is the time spent with the horses, seeing the country go by, and meeting the people; but competing overseas for the first time is also the next step in the evolution on the pathway to Jessica's big endurance goal: "Getting on the World team with my mom, like Valerie Kanavy and her daughter [Danielle] did." The Presidents Endurance Cup on February 16th will be another milestone on that path. It's a rare thrilling experience for any international endurance rider to get an invitation to ride in the Presidents Cup Endurance Race in Abu Dhabi, but for Young Rider Devan Horn of Texas, it's an endurance dream come true. "I'm beyond excited!" the 19-year-old says. "I haven't slept in 3 days!" Devan will partner with Jason and Ceci Butler-Stasiuk's CJS Maverick for the 160-km race on February 16th, which is known for its tough course in the sand (and often heat and dust storms), its large number of participants (usually over 100 starters), and its record-breaking finish times (6:21.35 in 2012, 6:25.13 in 2011, 6:21.12 in 2010). CJS Maverick is a 9-year-old National Show Horse (3/4 Arabian, 1/4 Saddlebred) with a record of 650 AERC miles, and 11 completions in 16 starts, with 3 Best Condition awards. It's an unusual move for the race's Organizing Committee. Normally, invitees are senior international riders who had not previously competed in Abu Dhabi; this year the decision was made to invite Young Riders to compete with the seniors. Reportedly, 16 foreign Young Riders have been asked to participate. Travel expenses are paid for a rider, horse, and groom. Never before has Devan ridden in such a large and prestigious, competitive seniors race; nor has she ridden CJS Maverick in competition before. Add to those ingredients the facts that Maverick has only competed in and completed one 100-mile ride, that he is very competitive, and that he has not faced a starting line with over 100 starters before, and one might forgive Devan for feeling a little intimidated. But none of that makes a dent in the poise and confidence that this Texas endurance rider radiates. Some of that self-assurance was surely transmitted from international competitor Darolyn Butler, whom Devan first met 12 years ago, and whom Devan considers a second mother. Darolyn is a long-time endurance rider, multiple National AERC Champion, multiple international medalist, and currently 6th in AERC lifetime mileage with over 33,000 miles. "My parents moved down to Texas when I was around 7," Devan explains, "and I had so much energy, they just dropped me off at Darolyn's house and said 'keep her'. So I started working at Darolyn's and helping out with her trail riding business, and it was just a natural flow into endurance riding. Darolyn's been really great; she's been my mentor since I was 7." Like Darolyn, you could say that endurance is Devan's obsession. "I was really lucky that my first horse discipline was endurance. I love everything about it - the time spent with the horses, the people in the sport, the Arabian breed. It's really the only discipline I can ever see myself doing." Devan has been competing in endurance on Darolyn's and Ceci's horses since she was 11 years old (Ceci is Darolyn's daughter); and since then Devan has completed over 2800 AERC miles, finished the 100-mile Tevis Cup, competed in 3 North American Young Riders FEI rides, and won a 120-km Young Rider race in England, her first time riding overseas. Her experience riding and handling many different horses will serve Devan well, and she has logged many training miles on Maverick, but, what about that first-time ride on a horse in a big race? "No doubt he's going to be very forward, and I'm going to have to really work hard to rate his speed. I'll have to focus on really keeping our pace, and keeping him controlled. But luckily he's not one of those horses who loses his head in a crowd." Maverick's current training for the Abu Dhabi race in the sand consists of doing what Darolyn Butler's endurance horses always do. "We're going to focus on long and slow down here in the heat and humidity, do a couple of nice rides, and take it day by day." Fortunately, Maverick will be familiar with the sand course in Abu Dhabi, because that's what he trains over every day. "It's all sand," Devan says. "The only time we're not in sand is when we're crossing the road to get to more sand!" Getting the international experience and getting to compete abroad is one of Devan's dreams. "I'm not sure where my endurance career is going, but I live for the International. i think it's just so great to be able to see another country from the saddle." On February 16th, this USA Young Rider will get to do just that. 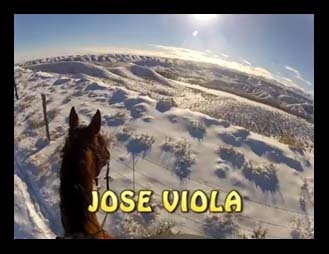 The only thing better than being in Owyhee is the good fortune of being in Owyhee in the winter after a gorgeous snowfall on a good horse.